It was a seemingly innocent statement, but it stuck with me. Yes, I know that the more you have to run the air conditioner the higher the electric bill. (Trust me, I know August is when the meter runs constantly.) But there was something simpler, more earnest in her statement. She was having to consciously think about choices. How much does she run the air conditioner? How much will her bill be? What would she have to trade in order to get the amount of cool, comfortable air she’d need? Would she have to work extra shifts to cover the unexpected expense from an early heat wave? Was this a sign that her entire summer would cost her more? We continued chatting about the upcoming weekend, the glorious freedom of a Saturday without plans, and then just like that we went our separate ways. But it’s been nearly a week, and I’m still thinking about her. I’m also thinking about my own situation. That a heat wave is more of a nuisance and less of financial hurdle. And then I think about all of the other seemingly mundane things that I do on a regular basis. I fill up my car with gas, buy groceries, turn the air conditioner down to frigid to sleep, take the critters to the vet. I don’t stop to wonder if I should fill up the car all the way. I don’t weigh out what I should and shouldn’t’ buy at the grocery store, although Cowboy would tell you it’s so much cheaper when I stick to the list. I just do what I need to do. And then it hits me, all of this day-to-day living that I don’t have to think about is a gift. Sure, Cowboy and I work hard, but so do most people I know. Working hard is not a guarantee. It’s not a free pass from thinking about the little things. Don’t get me wrong, Cowboy and I have to make a budget and live within our means. We talk about things like how much money gas costs or what we should budget for necessary house maintenance or how much hay the horses will eat in a year. But we don’t have to make hard choices like having enough to eat versus melting in the hot Texas sun. I am reminded that we live in a community of amazing and diverse people. And sometimes there are those amongst us that need a hand, and we should be willing and able to give it. It can be as simple as picking up a few extra canned goods at the grocery and donating them to your local food bank, or leaving an extra nice tip for a waitress who is working her tail off to serve you. It’s things like checking on your elderly neighbors and just spending a few minutes of time to make sure they are okay and to show that you care. We’re all in this life together, and sometimes it just takes the simplest sentence in the grocery store line to give us the reminder we need, to jolt us out of our comfort zone. If we will just walk around with our eyes wide open, we will find so many ways to share, care, and give. And you just never know when that simplest act of kindness can change someone’s day or even their life. Featured image © Cherries – stock.adobe.com. Standard license. Living on the farm has been downright inspiring for Cowboy and me, and we wouldn’t have it any other way. Inspiration comes in all forms, and to that end I’ve created a new page to link to those businesses and ideas that we’ve found helpful, inspirational, or just downright fun. You can click on Farmtastic Faves in the header anytime for a list of links or click on Farmtastic Faves from the category list. Each listing will be accompanied by a post so we can share why we love each one. And of course, we’d love to hear what products help you create your farmtastic life. First up is in the category of Ways to Give Back and comes to us from the state of North Carolina. We just can’t say enough about Kim Farmer and her prayer ponies! Kindness and compassion are important to Cowboy and me, and represent the way that we try to live our lives. Admittedly I fail sometimes, but I keep on trying. On this journey to make sure we help when and were we can, I discovered Kim Farmer and her beautiful Prayer Ponies on Facebook. It was through our mutual love of mustang horses that I found her amazingly beautiful mission, Your Silver Linings. A sampling of the one-of-a-kind Prayer Ponies. So what are Prayer Ponies? They are one-of-kind, handmade ponies designed to bring comfort in the midst of a storm. The first time I heard about them, Kim was looking for adopters to adopt a set of ponies where one pony would go to the child with a parent serving overseas in the military. The mission was simple, you adopt a set and one comes to you and one goes to the child. When you see the pony, you pray for that child and the child knows that someone has their match and is praying for them. Faith is an important part of Cowboy’s and my life, and we believe in the healing and comforting power of prayer. On top of that, we can’t say enough how much we appreciate our military families and all that they sacrifice so that we can live in this great country. We’ve both got veterans in our families, so we feel a strong connection and affection for those that serve. As you can imagine, when I read about this beautiful mission, my heart strings were singing, and I adopted my first set, Amazing and Grace. Amazing sits in my office and I know Grace is blessing a child who is having to make a sacrifice at such a young age. 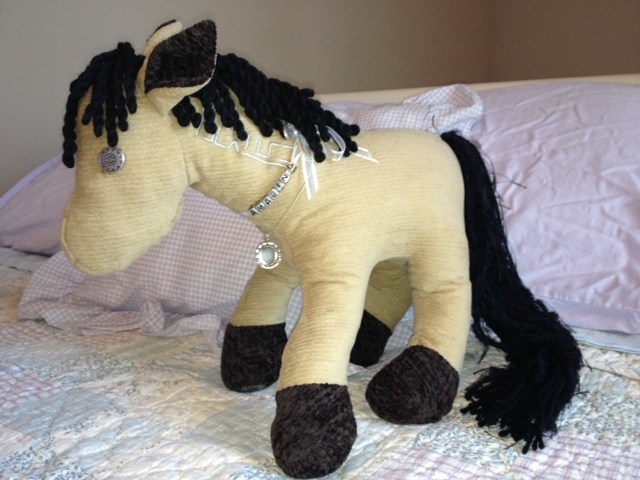 Amazing – my first Prayer Pony. Grace is in the loving arms of a child with a parent serving overseas in the military. Read about Kim’s story and mission on her website about how she found her calling and her way to give back. My personal favorites are the Mission Prayer Ponies and Mustang Prayer Ponies, but equally special are the Celebration and Vintage Prayer Ponies. Check them out and tell Kim we sent you. It’s one of the most beautiful ways to give back to someone suffering a loss or needing to know that folks are praying. I guarantee you will be blessed in return. P.S. – Keep your eyes posted. I hear that Kim is about have a whole new herd. Follow her on Facebook. P.P.S. – This is not an advertisement and no money, gifts, or favors were exchanged in return for this post.